He appeared on the 1870 census taken at Providence RI, listed as a jeweler. WILLIAM C. ALMY, OF PROVIDENCE, RHODE ISLAND. IMPROVEMENT IN COMBINED SLEEVE-BUTTONS AND LOCKETS. Specification forming part of Letters Patent No. 126, 368, dated May 7, 1872. Be it known that I, William C. Almy, of the city and county of Providence and State of Rhode Island, have invented a new article of manufacture, which I term a Combined Sleeve-Button and Locket; and I do hereby declare that the following specification, taken in connection with the drawing making a part of the same, is a full, clear, and exact description thereof. My improvement consists in such a construction of a sleeve-button that one of its faces shall constitute a locket. 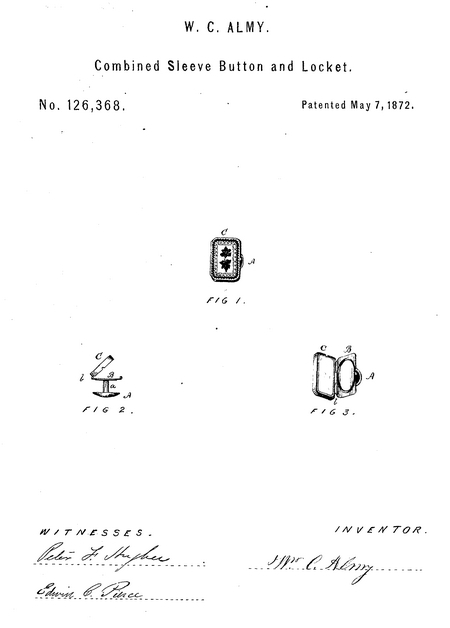 In the drawing, Figure 1 is a view of the article with the locket closed. Fig. 2 represents an end view of the same with the locket open; and Fig. 3 is a front view of the interior of the locket. A represents one of the faces of a sleeve-button, and a the bar which connects it to its fellow face. B corresponds with what in common sleeve-buttons is the outside face; but in this instance it is the lid of a locket, and is hinged at b to the box-shaped portion C, which is furnished with a glass, or otherwise constituted to receive a miniature or any other article desired to be placed therein. The plate B is also in this instance represented as countersunk to receive a miniature, but the form of the locket is immaterial. Tt may be of any preferred shape or variety of pattern. A sleeve-button and hinged locket combined, as a new article of manufacture, substantially as described. He appeared on the 1880 census taken at Providence RI, listed as a jeweler.